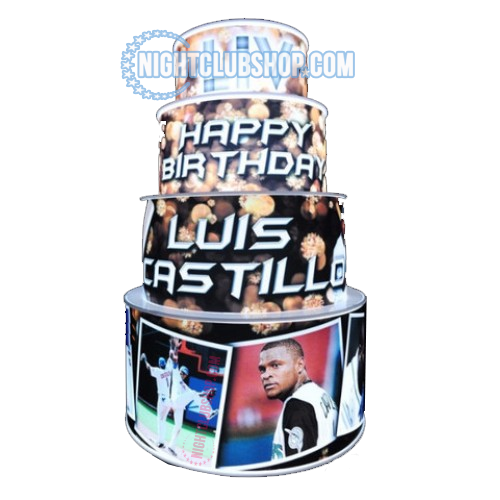 VIP LED BIRTHDAY CAKE VIP Birthday Presentation Bottle Service customized for your specific Nightclub,Wedding or Event needs. "LED BIRTHDAY CAKE" or "LED WEDDING CAKE"
Have you ever seen the MEGA Clubs using awesome bottle presenters, LED Cake bottle Holders, Led Cryoguns, or a confetti gun? Then you looked them up and realized they are way to expensive to purchase? These Bottle Presenter pay themselves off in one evening in large clubs and 4-5 evening in smaller clubs after that it is pure profit for the club. VIP Printing is making the impossible, possible for the smaller clubs to give their patrons the same VIP feeling the larger clubs patrons pay tens of thousands of dollars to enjoy. With cutting edge technology and branding capabilities we offer you the best way to set yourself aside from your competitors. Our Bottle Presenters are made to attract attention and almost indestructible (not that we want you to try to destroy them). Option 2: You can purchase our Monthly Service Plan which makes this presenter VERY affordable. You pay an Initial Payment which is reasonable and then you pay a monthly charge debited directly from your checking account on the first of the month with your first payment starting the month following your purchase. This is a monthly service plan designed to help smaller businesses ensure that their VIP Service products will never be out of service or unusable due to an accident whether your fault or not. With this monthly service plan you get the presenter of your choice or you can choose a custom made presenter and if 3 months down the road you drop it or it breaks, we will fix or replace the unit within 2 weeks of receiving it. You pay to ship it back and forth to us for repairs. Your monthly service plan ensures that you don't have to dish out another initial payment for your service tray as long as you pay the monthly service plan fees. If for any reason you would like to cancel the monthly service plan there are no penalties to cancel the service as long as you return the product to us before your next monthly service plan due date. Once we receive the Bottle Presenter back in our warehouse we will stop your monthly fees with no cancellation fees or gimmicks. If you should want to purchase a few of our monthly service plans items then we will give you a discount for multiple products. 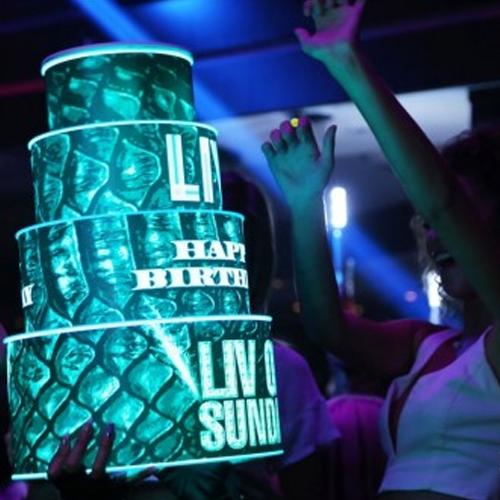 This way you can have a LED birthday cake, Bottle Presenter or two, LED Cryogun and a confetti gun at your disposal for only a few hundred dollars a month service plan. Before purchasing if you have any question please call us first. 813-720-0409.